One of the most fulfilling aspects of being an artist is the chance to collaborate and work with other people, Artists, Architects, City planners, Foundry-men and Women, etc. I believe that working with other individuals can only help to make any given project better. Here are a few examples of projects that I've done and worked on with other induviduals. 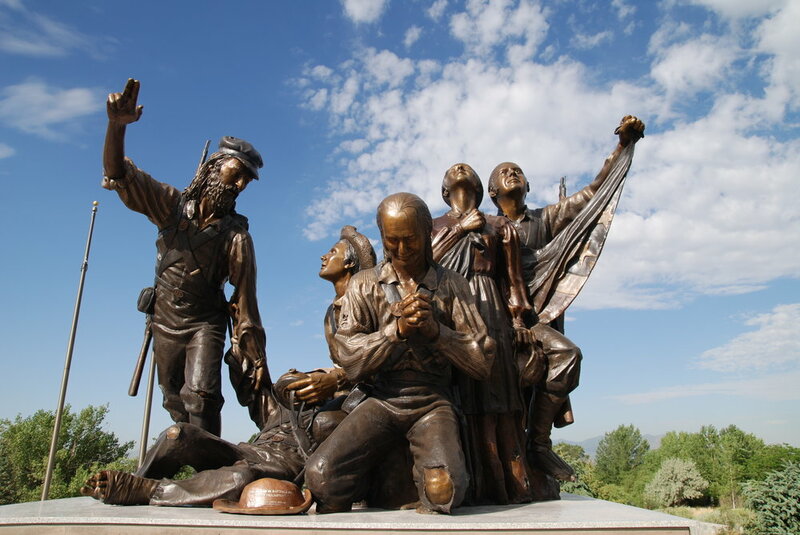 The Beckstead Memorial is a nine foot five figure bronze memorial on granite base with plaque. Created for the sesquicentennial of South Jordan City, Utah, 2009. This project was started with conceptual drawings, and working with city officials the final design was agreed on and the monument was completed and installed. This is a project I worked on for several years with another artist, my good friend Dr. Steve Neal. There are two sculptures, both 12 feet tall. One is five figures and the other six figures. Installation date 2010. Location, This is the Place State Park SLC, UT. This is a monument for my good friend Dr. Vern Swanson. These are the models for two tiers of a four tiered fountain. The figures will be holding a dish and there will be one more figure on top. The figures on the bottom tier represent the joys and sorrows of the children of the world.